Stefania Medvedik is a registered nurse that has worked in the health journalism field since 2004. She has written for Ivanhoe.com, "MAMM" magazine, and LIVESTRONG.COM. She holds a Bachelor of Arts in journalism and Bachelor of Science in nursing from New York University and is currently working toward her Master of Science in clinical nutrition at Long Island University. The human scalp contains about 100,000 hairs, growing at a rate of about half an inch per month. 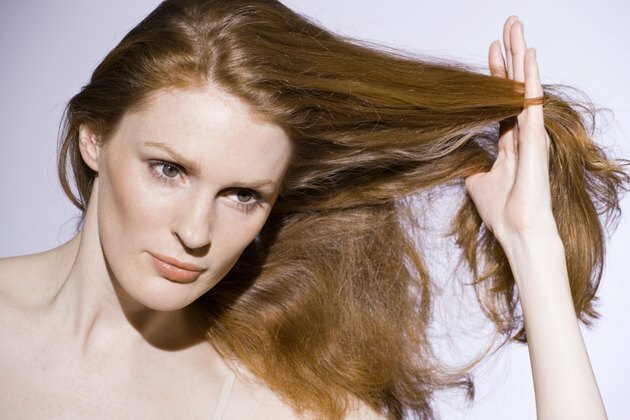 Most people typically shed between 50 to 100 hairs a day. Excessive hair loss can be a distressing condition affecting both men and women and can have numerous causes, from poor nutrition to disease. Kelp, a common food in Asian cultures, appears in herbal medicine and in supplements claiming to improve hair health. A large type of brown algae, kelp grows along the northern coasts of the Pacific and Atlantic oceans and North and Baltic seas. The seaweed is a rich source of iodine and contains minerals such as calcium, zinc, magnesium and iron, as well as folate, vitamins A and K, and amino acids, according to the U.S. Department of Agriculture's National Nutrient Database for Standard Reference. Kelp's richness in minerals, iodine, and amino acid content may help explain its touted benefits for hair growth. Certain nutrients in kelp, such as iron and the essential amino acid l-lycine, directly affect hair growth. Deficiencies in iron and l-lysine can impact hair loss in otherwise healthy individuals, according to Dr. David Rushton at the School of Pharmacy and Biomedical Sciences at the University of Portsmouth in the United Kingdom, in a 2002 literature review published in the journal "Clinical Experimental Dermatology." In studies conducted in women, Rushton reported a significant proportion of subjects with hair shedding responded to l-lysine and iron therapy. Kelp's high iodine content may also contribute to claims it can help hair grow. Conditions related to iodine deficiency, such as hypothyroidism and goiter, can cause hair loss and thinning, according to thyroid.org. While nutrients in kelp may improve hair growth, there is no specific link between kelp itself and its ability to boost hair growth, according to a PubMed.gov review. If you suspect an underlying condition, such as thyroid disease, is behind your hair loss, it's best to get evaluated by a health professional. Kelp's use to treat thyroid conditions such as goiter is not clearly supported by the current scientific evidence, according to MedlinePlus. The main concern with kelp is its high iodine content and potential to cause heavy metal and arsenic toxicity, according to MedlinePlus. Normal thyroid function was disrupted in healthy individuals who took kelp supplements, supporting previous findings on supplemental iodine's effects on thyroid health, according to a 2003 study by Dr. Clark Clifford and colleagues from the University of New Mexico Health Sciences Center, published in the journal Endocrine Practice. A sampling of kelp supplements showed high arsenic levels, according to a 2007 case study by Dr. Eric Amster and colleagues at the University of California-Davis, which documented a woman suffering from arsenic poisoning related to kelp supplements. Brown algae's ability to take up arsenic and its high iodine levels, noted in a 2007 study conducted by Dr. Christine Dawczinski and colleagues at the Institute of Nutrition at Friedrich Schiller University and Thuringian State Institute of Agriculture in Germany, led the researchers to recommend control of arsenic and iodine content in brown algae to protect consumer safety. Available in various forms, from supplements, to raw seaweed, to dried flakes that can be sprinkled on foods, kelp is also combined with different herbs in supplements claiming to promote hair growth. The type and amount of kelp consumed can affect how much of a certain nutrient and potentially toxic element you're exposed to. Nutrients in kelp beneficial to hair growth, such as iron and protein, are not present in large amounts in a typical serving, when compared with other foods, according to the same 2007 study authored by Dr. Christine Dawczinski and colleagues. Consult your doctor, especially if you are pregnant, have a chronic disease, or are taking medication if you're considering taking kelp supplements.